EPSON RUNSENSE SF-810 Review - Buy or Not in Apr 2019? The Epson Runsense SF- 810 is the top of the line in the Runsense series, yet is still an affordable lightweight watch promoted by runners. 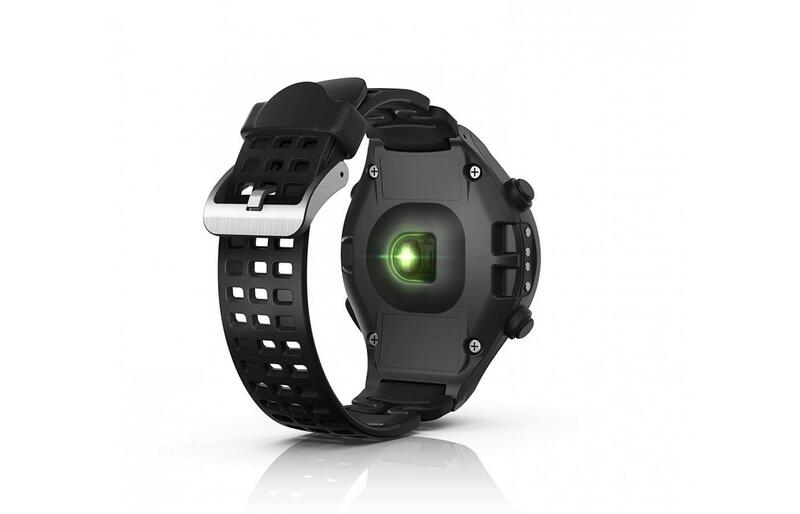 It features GPS and heart rate monitoring functions and is designed to maximize your running routine. It measures heart rate and other analytical statistics from the convenience of your wrist, which helps you track, evaluate and increase overall run performance. The Runsense automatically records your speed, length of stride, GPS location and heart rate levels via the sensor on the backside of the watch. The philosophy is that by computing all this raw data and analyzing it through the free Run Connect mobile app on a routine basis, you’ll ultimately become an improved runner. Long battery life - 20 hours with GPS or 2 weeks standard watch mode. The Epson Runsense SF- 810 is rich with qualities that are committed to help you reach your full running potential. Designed with the runner in mind, it can accurately monitor your vitals and routes so you sustain your workouts and maximize your running preparation. While the Runsense SF- 810 is capable of tracking stats for a variety of activities such as running, biking, hiking, or general cardiovascular training it is suited best for runners. 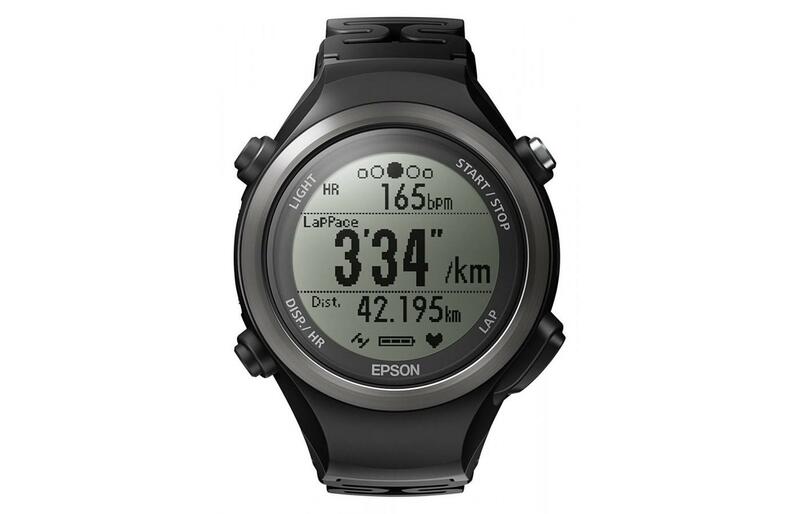 The Epson Runsense SF- 810 is waterproof to 50m and can be used during swimming but the GPS and heart rate features will be inaccurate if they work at all. The SF- 810 tested very accurate and aligned with other watches when compared. Since it was designed with runners in mind, these functions work perfectly for long runs and fine tuning your training. The Runsense 810 acquired heart rate quickly and the reported data was very accurate, but during intense running drills it regularly showed a discrepancy of 5-10 BPM Over all the Runsense 810 had a better than average calculation when compared to other heart rate monitors. The big issue with the SF-810 was not the accuracy of the GPS data, the one feature these watches are purchased for, which is highly accurate, but with the amount of wasted time waiting to acquire the GPS signal. Despite the connecting time to a satellite there was a noticeable distinction in time and accuracy of tracking compared to more expensive GPS watches. It typically was less than a tenth of a mile off even during longer runs, which is a far superior margin of error for a GPS device. The Runsense View Portal allows you to store your training data online and offers a suite of analysis tools. The Dashboard View in the Run Connect app is however, poorly mobile-optimized. You are able to see a calendar with the dates you trained, as well as results from each session, including heart rate, a map of your route, elevation and your pace. However, on most smartphones the icons and script is small and challenging to read sometimes. Plus the Bluetooth capability is lackluster at best. It’s better to connect through your computer after you get home. To connect at home you get to tackle the block of a charger. However, I essentially liked it if I was at home. The watch fastens in the charger securely and you never have to work it around to get a read like some other watches that come with a charging clip. But, if you are traveling, the extra mass tends to be a bit of a nuisance. The Run Connect mobile app lets you upload your running data straight to the Cloud – you can then access and analyze your records while out and about. Also, you are able to use the app to manage the GPS connection and customize the settings on your SF-810 device. The Epson Runsense SF- 810 is compatable with the free Run Connect mobile app but it is pretty basic in design. It is however, easy to transfer and analyze your data through other popular running apps such as Strava™ Runkeeper or MapMyRun. This has been recommend in more than a few reviews. No need for a cumbersome chest strap when there's a built-in optical heart rate sensor, which allows for up-to-date heart rate monitoring, on the backside of the Epson Runsense SF- 810. For the best performance, make sure that the strap is securely tightened around your wrist for optimal accuracy of the sensor. If you sacrifice security for comfort, the data will be less accurate. That said, what runners sacrifice in a quality appearance, they will benefit from the compact and lightweight feeling during longer outings. At just 52g the Runsense is barely perceptible on your wrist, which makes it ideal for runners or sporting around town for casual activities. The one bow to higher end GPS running watch is the solid alloy bezel which somewhat improves the durability and looks, but not enough if you're looking for a running watch that will handle a beating. On the favorable side, the Runsense SF-810 is waterproof to 5ATM (50m). After a couple outings in light showers; it held up well and should manage fine if you're out competing during a thunderstorm. While not as flashy looking as other running watch displays the Runsense SF- 810 face works smoothly and lets you easily track every statistic as it happens. There's no impressive touchscreen or high-res color scheme on the display on this model: it's a basic LCD. I did like that it's always on, and easy to read basic time, date and percentage of charge remaining and even trail running at night was achievable thanks to the bright backlight, which illuminates the face for ten seconds at a time. The watchband on the Runsense SF- 810 is designed for performance with its lightweight and water-resistant design. The band itself is holey as is usual with other running watches to be adjustable to larger or smaller wrists and is designed to expand while training. The sensor for delivering accurate heart rate is on the bottom of the face so keeping the strap tight to your wrist will ensure proper data measurements. Compared to other beefier watches, the band is a little flimsy but works sufficiently for the smaller Runsense. The Epson Runsense SF- 810 comes in only one size and measures 1.76 x 2.31 x 0.56in and weights in at 52grams, which is right in the middling of other running watches compared. 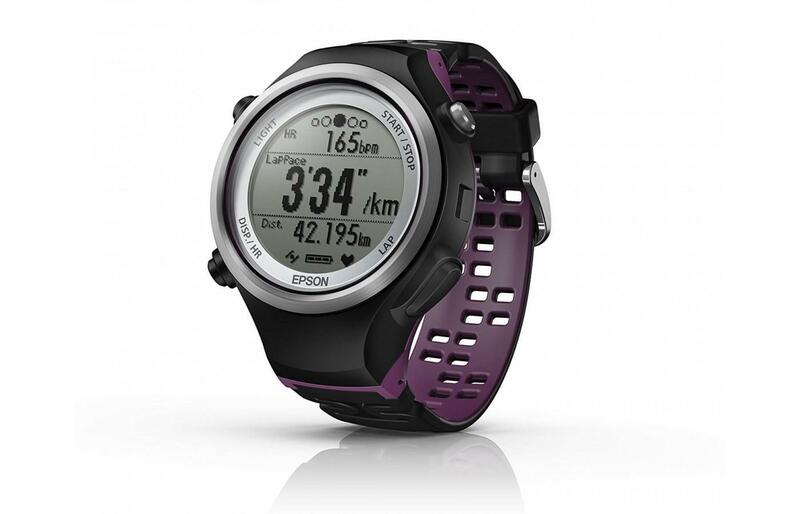 If you are looking for a smaller watch, Epson offers a total of four watches in the Runsense series. If you’re like me, setting up the watch for the first time will test your patience. The quick start manual is around the size of a novel, only to find yourself flipping through endless selections for what seems like infinity. Once you have it set up, though, the watch functions without much effort. It works equally well whether you’re outside or on a treadmill. The app that ties into the Runsense SF- 810 is basic and a lackluster, but it’s compatible with other running apps, which improves things significantly. In general, it’s well made, easy to use once it is setup and can assist you in becoming a better runner, but does have some weaknesses. The display has a low-resolution dot-matrix design and can be difficult to read in dim light or bright sunlight, and the amount of data crowded on the smaller screen could be a challenge when running at a good pace. Oh, the Epson Runsense charging and syncing dock. Well, it's massive, bulky and really a bit of a hassle to tote around. The one upside to the beast of a charger is that the watch does clip securely in place, ensuring the watch gets a strong charge unlike some of the clip chargers. Not sure if syncing using Bluetooth would be faster for data transfer, but it would be nice not to have to travel with a large hunk of plastic just to charge my lightweight running watch. The Runsense SF- 810 is the higher-end running watch in the series but the good news is the price has dropped a bunch from when it first came onto the market. The SF-810 is packed full of functions not available on other watches at the lower end of the Runsense series. Compared to other full-featured GPS watches it is more affordable but it does include features some beginner runners will never use or need. With its simple design and purpose, no accessories are offered or needed other than maybe a ClearTouch Crystal screen protector for the Runsense SF- 810 running watch. • GPS Tracking. Similar to other running watches, the Runsense SF- 810 features built-in GPS that records your route, pace, distance and altitude via a highly accurate wrist sensor. • Tap functions and vibration alerts. Easy to use tap feature to perform assigned tasks and alerts to keep you aware of your predetermined goals. The Epson SF-810 is a unique peculiarity in the GPS running watch scene. It has some unique features that few other running watches have; optical heart rate monitoring that is actually mostly accurate for instance. Its GPS accuracy is solid and it has better than average battery life, 20 hours. However, when it comes to advanced features and ease of setup it falls short of equivalent heart rate monitors. Comparatively though, the Runsense SF- 810 is an affordable way to monitor your fitness training and helps you run harder and train smarter by automatically measuring your cadence and stride length. Log more training miles by setting your target pace then choosing between alerts to stay within your set pace, scheduled distance and target heart rate so you maximize your running miles. So, for the athlete that is contemplating working hard and is looking for a straight forward no frills watch to take back control of their health and running abilities, the Runsense SF- 810 is a solid choice to help attain your goals.